Prayer is a game changer. When done consistently, our hearts learn to lean towards Jesus in all areas of our lives. The abundant life that He speaks of in John 10:10 becomes a reality. This is not to say there will never be trials, heartache, tears, and anger. These things are a given when living in a broken world. However, cultivating an active prayer life will change the way we deal with these things and create an overall sense of peace and calmness amidst the storms. Fears will still come, but they won't pull us under the roaring sea. When prayer is part of your day and part of your life, your life truly will change. Sounds great, right? 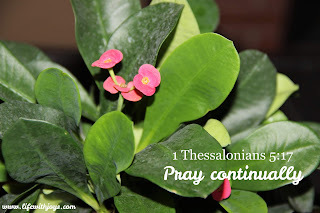 But how does one pray continually? We have so much going on in life and so many things to think about, plan, and execute. I remember on numerous mornings telling myself I was going to pray throughout the day only to crawl in my bed that night and realize I didn't utter one prayer. I would get discouraged and frustrated with myself. I began to really think about how I could pray continually throughout the day. I realized (God probably actually smacked me with this reality!) that prayer is not a wordy, impersonal act. Prayer is literally just talking to Jesus. Prayer is our direct line to Him. Think about it...we talk to ourselves all day long. Instead of just speaking to ourselves, we can train our minds to speak to the Holy Spirit more than we speak to ourselves. And that, my friend, is prayer! Nothing fancy. Nothing showy. Just pure, honest talk. So how do we train our minds? With lots of practice. Anytime we begin something new, it takes effort. We create habits over a series of days and weeks, not minutes. The practice of continual prayer is not meant to frustrate us, it is meant to encourage us and enrich our lives. There are many ways to train our minds. We are all different and, therefore, some things work for some while other things work for others. I'm going to share how I was able to train my mind. You can use it all, you can use bits and pieces, or you can throw it all out the window. Do what works for you. 1. I begin my day with Jesus. Before doing anything else, I grab my prayer journal and write out what I am thankful for, personal prayers, and prayers for others. Prior to beginning, I ask Jesus to show me sins I need to confess and people I need to forgive. This clears my heart and prepares me to focus on Jesus. By waking and going to Jesus first thing, I center my thoughts around Him rather than around me. It has made a HUGE difference in my life. 2. I committed to reading Scripture daily. This is often done mid morning or early afternoon. I have found that this has helped me so much. If my mind wanders away from the will of Jesus, reading Scripture always brings me back to Him. This can be five minutes or thirty minutes. It is dependent upon my day. However, I generally always stick to it because it has made such a difference in my mindset and heart. 3. I like to focus on a verse each day. When I wake in the morning and have something on my heart, I will look for a verse during my prayer time that I know will help center me. For example, if I am in what if mode, I will think upon Philippians 4:6-8. If I do not have the verse committed to memory, I will write it down on a small index card and keep it with me. These practices have been so helpful in training my mind to think upon Jesus throughout the day. My prayers are short - often one to two sentences - but they are consistent. For example, if I am outside with my puppy and hear a bird, I will tell Jesus what a beautiful sound He created and thank Him for allowing me to hear it. Praying consistently has made such an impact on my life. I feel so very connected to Jesus. I recognize His presence so often and feel Him speaking to me. There truly is a peace that surpasses all of my understanding and I know, without a doubt, that it comes from having an active prayer life. My mom recently said something that was a golden nugget. I grabbed it and tucked it away for safe keeping hoping to never forget it. She said, "As I'm praying throughout the day, I don't say Amen. I keep my heart open so that my prayers are flowing all day." I love that! Let your prayers flow all day and feel the transforming effects of a consistent and active prayer life.